It’s Lahdahn innit? From the Queen to the Routemaster bus (the original, not the new-fangled one), London is iconic. To celebrate al things London and British, the lovely folk at House of Dorchester who have been making chocolate goodies for 50 years have released some lovely London celebratory chocolates, toffees and fudge. The House of Dorchester is probably supplying chocolate to most of the landmark buildings around the UK. Those bars you see with the name of the monument on them in large, almost triangles are from House of Dorchester. Even husband, a fussy chocolate eater, loves their chocolate orange cars and nommed one at Spring fair where the lovely folk gifted us a few bars. The milk chocolate is, I’d gamble, a best-seller as it is quite addictive. The iconic scenes on the wrapper soon forgotten despite the hours of work that went in to them because the chocolate treat inside is what the real gift is. 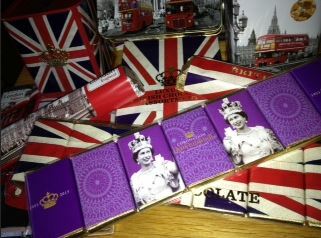 In celebration of the Jubilee, House of Dorchester have released these awesome London chocolaty/toffee-y/fudgy gifts and while you *could* go and buy them at your favourite attraction and bring them home to the US or Canada or Australia as gifts, you could also WIN THEM WITH US! 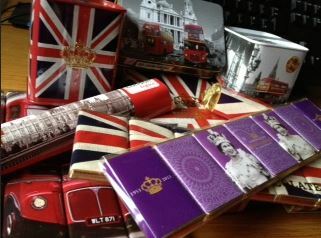 That right – those amazing folks at House of Dorchester sent me these amazing London gifts and I’m giving them all away? There is so much chocolate you could have a party (remember to invite me 😉 )or give some as gifts or whatever. There are two money box tins which have either fudge or toffee, a little pretend suitcase with toffee (I think) and an iconic London scene, There is the Routemaster puzzle in chocolate squares that’ll keep the kids busy for ages, a British flag of the same ilk, there is a line of purple chocs (for royalty) and a younger queen to celebrate her Diamond Jubilee, two of those iconic bars, a box of filled chocolates covered in an image of the flag, a large box of chocs that make a flag (another puzzle for the kids) and a line of British flag squares of chocolate. 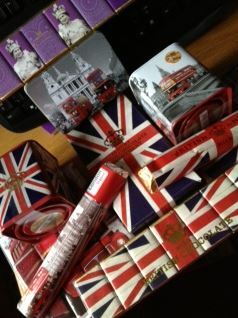 That, my dear readers, is a LOT of chocolate and it is all lovely iconic London or British themed. Why not have an ‘I’m (not) a Londoner” party (depending on where you live). I have all of this myself and I have to post it myself and I know the weather is going to be an issue so I’m afraid this is for the UK only folks. To enter, because there is SO MUCH CHOCOLATE from those lovely House of Dorchester folk, I’m using Rafflecoptor and enabling entry through Facebook, blog comments and tweets. To enter through the blog (required), leave a comment of *MORE THAN TEN WORDS IN LENGTH* talking about your favourite London place. For example, my favourite place is the British Museum. It is free to get in and the knowledge you gain by walking its halls and reading about the history and pre-history of the whole planet is priceless and enchanting. Please remember that these amazing chocolates are thanks to the wonderful folk at House of Dorchester who are celebrating 50 wonderful years. Remember to thank them too if you win! 1.The competition will finish at noon GMT on Wednesday 11th September 2013. 3.Only available to UK mainland addresses. 5.I reserve the right to exclude entries that I feel are inappropriate (for example, change the tweet or do not leave the minimum 10 words) or are not in the spirit of the competition. 6.Your details won’t be passed onto anyone else and will not be kept in any way. My absolute favourite place in London is St Pauls. I’m not sure why it resonates so much with me, I think it has to be the images of it standing strong in the Blitz – it’s pround and strong, and I smile whenever I see it. I love the Natural History Museum. Not just the exhibits but the building is also amazing with all the carvings. When my son was little and invariably up at the crack of dawn we would drive in early Sunday for a visit – no traffic, no congestion charge, and if you’re lucky free on street parking, and lots of dinosaurs. I love Covent Garden because it is so vibrant and has so many nice eateries! It also has one of my fave restaurants, Food for Thought! Yumyum! London has some of the best free museums and I have been twice to visit some. My favourite is the Imperial War Museum, which has a truly devastating Holocaust exhibition; the National History Museum is also great. The Southbank is my favourite place in London – I love the amazing view over the Thames. My family and I like to visit Bunhills Cemetery when we are in London. It is lovely and peaceful and my daughters like to feed the squirrels. My favorite place is the south bank. We love walking along the Thames and going for a nice coffee. I love the Thames. Every time I visit London I go for a boat ride down to Richmond – its a lovely leisurely way to take in some of the sights of the city. I havnt been to London for years butI loved Carnaby Street when it was still there. My fave place in London is the South Bank. Lots of great stuff there including the Globe theatre and the Tate Modern as well as the little boutique shops in Gabriel’s Wharf. I’ve only been to London a few times, years ago, but I have fond memories of the dinosaurs in the Natural History Museum. My daughter was very impressed with them at the time. Well, them and the escalators to the Underground. I love the Whitechapel. The victorian buildings are amazing and wandering through the back streets feels like you have been transported back in time. It’s always worth popping into the Blind Beggar for one of their delicious salt beef sandwiches too. My favourite place in London is walking along the Thames during the summer as it makes it look very pretty. The Science Museum has many happy memories for me – the more things to poke and prod the better. My favourite place is Oxford street, i love to wander looking in all the department stores. I don’t have a favourite part of London but I do have a favourite thing to do which is walking. The last 2 visits we’ve bagged the tube and walked to where we needed to go and we saw so many lovely sites such as cute buildings, stunning statues and lovely flower beds. I’d recommend it to everyone! I have NEVER visited London as i am from wayyy down the west. But i would LOVE to see the Lanndaaan Eye! I will one day, and i hope it’s as magical as i think. I love to go shopping in Oxford street, and pretend shopping in Harrods, and going to the west end to go to a show. My favourite place is Postman’s Park – a secluded little spot smack bang in the middle of the busy business sector by St Paul’s. It’s an oasis of calm surrounded by chaos. Fun fact: it also appeared prominently in the film ‘Closer’ starring Jude Law and Natalie Portman. Only being to london once and didnt explore much – but i loved hamleys toy store!! I love St Pancras station. I love its charm and nostalgia – something that you don’t often associate with London. The Champagne and Oyster bar is also a lovely place to go for a romantic treat. I took my five year old son to see Buckingham Palace during the summer, he loved it! I love the southbank, lovely places to eat, nice views of the river and great galleries. I love a Tate Modern morning finishing up in their restaurant for lunch with great views. I went to London for the weekend a couple of months ago. I went to the London Dungeon for the first time. It was fantastic! Lots of fun, but also a bit spooky. Didn’t realise what it was but had such a great time. Victoria coach station as it means I have arrived for a good time or are about to leave for home. Either way a great place. My favourite place in London has to be the Tower of London. I love the gory history of the royal family, in particular the tudors and this place really brings the rich history of our country to life! I love visiting all the museums especially the British museum and all the shops followed by a trip to Hyde Park. My favourite place in London is Leicester Square as it always feels really busy and vibrant, and very importantly, it also has the Haagen-Dazs Cafe! Tower of London – Centuries of history to explore, so much to see including the amazing Crown Jewels! I’ve never been to London, so I can’t really say what my favourite place is. However, I would love to visit the London Eye, Madame Tussauds and Buckingham Palace. I love London zoo .It is steeped in history and a wonderful day out. I absolutely love the food hall in Harrods lol i could spend all day there exploring new things to try and buy. I haven’t been to London for years. The last time I went I looked around Harrods, which was fantastic, and went to the Queens garden party because my son was trooping the colour. It’s very hard to choose but at the moment I love brick Lane. It’s colourful, foodie, great pubs and arty. My fave place in london is the london eye of course!! I like London Bridge. The views across Tower Bridge from More London are lovely, although the wind is a killer in the winter. I love the British Museum. I was lucky enough to be selected to attend a coin school there a few years ago that lasted for a week and was an amazing experience and the BM will always bring back good memories! My favourite place is London is the London Eye. My mum, sister and I went on the London Eye just before Christmas at night time and it was so beautiful – the view is amazing and the atmosphere fantastic!! I just love the fantastic national museums in London, its absolutely fabulous that they are now free to enter. I love the natural history museum and of course the sciense museum, they are so fun now. Much better than when I was a child. Wembley Stadium us my favourite place in London as it makes me so proud to be British and shows the rest of the world our beautiful altricultur. My favourite place is the Houses of Parliament. The history, paintings and things to see in there is so interesting and seeing Big Ben right next door and realising the size of it is awesome. Buckingham Palace without a doubt – walking down the mall and seeing the amazing fountain and standing at the gates of the Palace, makes me extremely proud. I love the London Eye. I love that you are able to see all around London and you are able to see the landmarks. It can also be a romantic place and its lovely to go up there on a nice sunny day! Visited London for the first time last year, can’t wait to go back. My favourite place was Covent Gardens – loved the pubs, the shops everything! My favorite place in London has to be Portobello Road, especially on a Saturday. It’s local to me and I love that even if you go there every weekend each week will be a totally different experience. I love that it is so diverse in so many ways. I love the Tower Bridge and like to walk across it when in London. I like Buckingham Palace,I am a true Royalist and like the fact that we do the pageantry so well. Last time we went to London, we had a trip on London eye. I thought it was amazing and will never forget the view. My family and I really love the London Aquarium it is like entering an underwater world! The Natural History Museum comes a very close second and it’s free! My favourite place in London has to be the Tower of London. It is so iconic with so much history. The best place in London for me has to be the British Museum. It has got to be one of the very best museums in the world, with the largest and most diverse collection imaginable. My favourite place in London has to be my dad’s parents’ house in Enfield. As I grew up living in Edinburgh, the trip down to see the grandparents was a great trek, covering half the circumference of the Earth, or so it seemed, and I remember once my brother and I constructed a bridge out of pipe cleaners which bridged the gap between two rows of seats. Then the tube trip on the Piccadilly line to Oakwood, then the march from the station to the house, where the lovely welcoming couple took us in, fed my parents with tea and me and my brother with biscuits. I remember them very fondly. They died about eight years ago, not very far apart. My favourite London place is the aquarium. I don’t get to go to London often, have only been about 5 times and I’ve been to the aquarium twice. I love the glass like floor that you can walk over above the sharks! Kings Cross St Pancras – the gorgeous statues, the hustle and bustle, the random pianos… a train station like no other! My favourite place in London is the West End – specifically the Queen’s Theatre. I live and breathe theatre, and as my favourite show is Les Miserables, that particular theatre really feels like home to me. It is stunning inside and to witness such a masterpiece of storytelling on the stage is quite unbelievable. Every theatre in the West End I’ve been in is stunning and the atmosphere is always special, but the Queen’s Theatre will always have such a special place in my heart. I’ve never been, but would really like to go on the london eye! It looks lovely and I imagine it to be a spectacular view when your up high! We recently went to London and to St Paul’s. I’m not a religious person but being inside the cathedral still made me go wow. It’s beautiful. It’s also a nice area too. We had lunch at a nice cafe. Although in London it is quiet (quieter than Oxford Street). It would have to be the Thames because I’ve been down it several times on pleasure cruisers and seen such wonderful historic things including where they used to hang people and wait for the tide to come in!! my favourite place in London are ALL of the Theatres- there are so many lovely ones- where you can see amazing plays with wonderful actors/dances and the like- for a FABULOUS time- try it and see! It’s difficult to choose as there are so many great places but I have to say my all time favourite place to visit has to be Buckingham Palace. Just the beautiful architecture is enough to gaze a in wonder. The Science Museum, there is so much to see and do and you learn something new every time you visit. My daughter now loves it too and it is always top of our visit list whenever we take a trip to London. I would love to visit London to see the new David Bailey exhibition at The National portrait Gallery in 2014. My fave place in London is probably Richmond Park with all the wild deers. You’d never expect such a beautiful, big and natural place right in one of the biggest cities of the world. I have only visited London twice, the first time was with primary school to visit the Millennium dome, when that’s what it actually was! The second time was with Uni to see the dressage at the 2012 Olympics held at Greenwich which was a very beautiful venue. I love the Imperial War museum, or more precisely the Peace garden. It is such a haven of calm in the otherwise manic place that is our capital city. The Barbican is my favourite place in London. I’ve been to some fantastic concerts over the years. Great memories! A less well known gem of a museum that I could spend hours in is the Geffrye, with it’s period rooms and gardens and lovely atmosphere. geffrye museum Definitely one of my favourite spots in the big smoke. Greenwich – easy to get to, plenty to see and a nice undercover market too! I love Covenant Garden because of the street artists and great stall. For quieter moments I love taking a trip out to kew. For wonderful indulgence I love the Hummingbird bakery. I used to work in Nottinghill gate in my holidays as a student and that area still feels like a kind of second home. There are just far to many places in London to pick one favourite. As I come from a rural village in Northern Ireland, going to the ‘bright city lights’ is just awe inspiring. I love the culture from the museums and theatres, the regality of the palaces and royal houses, the architecture of the landmarks and statues, the flavours and tastes of the many restaurants, the peaceful respite of browsing the cities markets on a Sunday morning. I love the hustle and bustle of the city centre and the sights when ambling along the Thames. I relish my weekend breaks in London whether they are with my family or my best friends. Each trip offers something different and new and the experiences offer memories that we talk about for many months after. So how do you expect me to pick one place when every place ends up a favourite for it’s own reasons and memories? I just love London and all it has to offer. London,my city has so many places to visit and enjoy but London eye is the one to be…after that a trip from London pier in river Thames for 1 hour totally relaxing.. I love the V&A as you can wander and be exposed to culture from th whole of the Empire, and the displays have regular special features. Regent Street for the shopping and Regents Park for walking and relaxing in. Although there are plenty more places I could choose. The first time I went to London we went to the Globe Theatre to watch Edward II. I think that area on the bank is my favourite place in London. I’ve only been twice, I’ll be going again next month, so maybe I will find a new fave place! My favourite place in London is probably the Theatre District – I enjoy coming up to the city to catch a show, do a spot of shopping and tuck in to an indulgent afternoon tea. Most recently I enjoyed Chorus Line followed by High Tea at the Langham Hotel. I love Brick Lane, the shopping is so much fun – discovering vintage bargains, and the curry houses are the best in the UK. I haven’t been to London for about 10 years, but when I do go I’m always captivated by Tower Bridge. I work in Civil Engineering and marvel at the design and try to imagine how they built it! I really enjoyed Madame Tussauds when I visited recently, lots to see and do! I have a waxwork model of my hand made which was good fun. I love visiting London – One of the best places we visited was Pollocks toy museum so quite and interesting away from the chaos of London. I love the immense variety of attractions in London. We loved the Thames lunch cruise and the London Eye. Also the tranquility of the parks after the bustle of shopping. Colombia Road flower market – in addition to it being a great place to buy flowers and plants, there are some great foodie places. It is within walking distance from Shoreditch and open on a Sunday. Go late in the afternoon for the best bargains. In Rotherhithe there is a cute little church called St Mary Butts and is accompanied by the village hall which was once the mortuary. This is next to a part of the Thames referred to as Dead Mans Wharf because all the bodies would wash up there. It is a beautiful little square crammed full of history. I’ve never visited London, but I’d love to – Harry Potter world! It’s a tough one but maybe Regent’s Park. A relaxing place to rest. Ive just come back from a weekend in London and we went to Buckingham palace state rooms. It was great to be able to get inside the palace and see all the fantastic rooms and memorabillia. I would definately recommend visiting the state rooms when they are open to anyone. This was the highlight of my trip to London by far. I guess every thing depends on when and who I am with, I used to love nights out in Camden as a teenager, I love the rainforest Cafe when I am there with my kids but I guess The Natural History museum is my favourite destination (followed by the photographers gallery). I’ve not been to London much but I always remember going to the National History museum when I was younger. At the time I think I found it a bit boring but I would really like to return and take my nearly 7 year old son to see all of the dinosaur artifacts! My favourite London place has to be the Royal Festival Hall. I love the view from the Balcony – you can see right along the Thames to the Houses of Parliament and beyond. It’s also free, with essentially the same view as the London Eye! Can’t really say I have a favourite london place. Considering I lived down in bromley for 5 years a few years ago I didn’t really bother going into the city itself all that much apart from for work. Suppose if I must be pressed, the greenwich observatory. My favourite place in London is Hyde Park. There is so much space and greenery. It’s a really beautiful and huge park within walking distance of the hustle and bustle of the city. The last time I visited London, we took a picnic, and had a bike ride and roller skated through the park. It was a wonderful place to be able to relax after seeing all the other sights in London. I love so many different parts of London it’s hard to choose a favourite! But the foodie in me would say Borough Market – so much great food to choose from! As a child I really loved the Science and Natural History museums. You can spend hours wandering about, there’s something interesting round every corner. My favourite place is St Martin in the Fields during the regular lunchtime concerts. Getting lost in some fabulous music while looking at the simple but beautiful window brings a serenity from the hustle and bustle outside. I love walking around Fortnum & Mason and looking at the amazing food. We finally visited London two years ago for my mums 60th birthday. It was great visiting all the places we have always wanted to visit, especially Harrods and Buckingham Palace. My favourite place was walking on the embankment along the Thames looking at all the buildings. Being a real history buff it was amazing seeing all the history I have read about right in front of me. The place I we never managed to see was the Tower Of London. We just didnt have the time and I was too nice to put my foot down and demand that we go there. I wish I had now! I will managed to go again hopefully when we manage to save up for it! I ♥ London as I have the bracelet to prove! Love to walk up Burlington Arcade an only afford to window shop but its fun to pick out all the things you would buy if you won the lottery even if you don’t do it and explore how the other half live. my favourite spot in london is camden market – its such a rabbit warren of lanes and isles with more and more treasures around every corner. it has such an amazing identity of its own. we visited a really cute little cafe inside an antiques stall it was hard to work out what was for sale and what was a chair to sit on!!! My favorite place in London is the Southbank, it is easy to get too just off the train at Waterloo and a short walk over the main road. There is always something going on that you can either walk around or sit and listen to Music, the views are amazing over looking the Thames, you can always take a little walk past the Street entertainers or even a trip on the London Eye, and to end the afternoon a nice drink and nibbles in one of the many bars. I love IT!! I love Carnaby Street, I remember my first trip there with a school friend back in the 80’s we were both Mods! OK so it wasn’t the 60’s but it still stuck with me! I went back recently and the nostagia hit me in waves! It would have to be Leicester Square and the West End purely for all the fabulous entertainment and theatres. I’m a theatre-addict and I can’t get enough of musicals so that’s my place to be when in London! I love the Imperial war Museum. Fascinating place enjoyed by adults and children. I’m looking forward to going again now it’s been refurbished. I used to live in London so have many good memories of the City, but my favourite place would be the Zoo, so much calm in such a busy place. My favourite place in london is the South Bank of the River Thames as it’s where my husband and I got together 15 years ago! i the theatres or the night life! i like the quirky markets and the boutique shops ive only ever been once and would love to go again to see more of it all! I love Hamley’s, as the first time I went to london was when I was 15 on the train by myself and I bought the most gorgeous chess set from there which 17 years later is still in perfect condition and now played with by my son. The Embankment at night is my favourite place, particularly in Autumn and Winter. Walking along the river from the national Theatre is so romantic. I also had one of the most heart-stopping kisses of my life on Waterloo Bridge when I was a student years ago, so that holds very dear memories. I love being on a boat on the Thames – there’s nothing better. You’re on a relaxing boat being able to see many of London’s magnificent sites. It may seem like an obvious option but I love so much about it. You can go to speakers corner or get an ice cream. You can relax by the Serpentine or go out on a boat. My favourite place in London is Kew Gardens. It is not free to visit, but for a small entrance fee you can enjoy beautifully maintained gardens. It’s great in the winter as you can spend time in the heated greenhouses, and they have some great cafes and restaurants. I have always liked Hyde Park because of its history and the different events that go on. My first time was when I was a student on a march in the 80’s. I love the Science Museum – there is always something new and interesting to see and do and it is the most brilliant place for children. I have never been to London believe it or not and i am 32.It is somewhere i really want to go and visit,i would love to book a posh hotel and go to the theatre. London Zoo Ever since i was a child i have loved going there many times, to see the many and varied animals. Not just to see them but to learn about them, especially the endangered ones. The V&A. It’s an amazing museum that always surprises. It hosts a great Friday late nights, their cafe is lovely and it has the best museum shop i have ever been in. Mine has to be the Natural History Museum, I think the Central Hall is amazing! My favourite London place is Selfridges. You can spend a day trawling the store and the history of Mr Selfridge is fascinating! I haven’t been to London in years, but found the Tower of London well worth the visit. Also when I last visited I really loved the atmosphere of Covent Garden. I haven’t been to London for a few years now but I have always loved the Science Museum. I think it’s fascinating and can wander around there for hours. I love The Hard Rock Cafe as not only does it have my favourite pulled chicken burger to eat but so many great rock items to see, the vault is an interesting little place downstairs with extra facts from your guide and its always cool to buy a souvenir from the Hard Rock shop across the road! My favourite place in London is the Natural History museum I love wandering around looking at all the exhibits. My favourite London place is The British Museum because there is so much to see and I love all those old Egyptian statues and the Rosetta Stone. I love going to Covent Garden there is always something going on and the shops are great some amazing things I like going down stairs and having a coffee listening to the music great day out. Covent Garden is my favourite, especially around Christmas. After we’ve shopped and taken in the atmosphere we love to sit al fresco and listen to the buskers. I love the hustle and bustle of London but I also love the quieter places such as Greenwich Park with its fabulous views of London, the deer, the café and the Meridian Line. I love the London Eye, it’s so peaceful up there and the view is magnificent. I’ve only been to London once, but my favourite place there is Madame Tussauds. I just loved the waxworks, looking at how detailed they were and seeing how similar they were to the real thing. My favourite place is a family trip to the London Wetlands Trust at Barnes; its a real relaxing day out which my daughter and her little cousins enjoy the freedom to explore. I haven’t been for a long time but would love to take my grandchildren to the british museum as it is my favourite place. We have great museums in the North but this is by far the best. I love oxford street for the shopping because it has a magical feel to it plus it has loads of big stores. I love Buckingham Palace, there’s so much history, if those walls could talk!! I love all of the riverside places but especially the south bank and along to the Tate Modern. There is always loads going on there, you can see all the iconic buildings of London, lots of nice places to eat. Also, I once saw the actor James McAvoy which made the most gorgeous scenery of all! I love the Science Musuem in London – the children always seem to find something different to do. Earlier this year we took our two children to a special event hosted by Coca-Cola about their link with the polar bears and the environment. My favourite place in London is the London Eye. Amazing views at the top. Covent Garden as it has great shops, great restaurants and as a dancer I love it because of all the performers and of course Pineapple Dance Studios is based there! My favourite London place is Borough market. I love trying all the different foods, the smells and noise of the place. You always have a take a little treat or two home for tea too! The Science Museum. Always something new to see, discover and learn while being entertained. I love Camden, soaking up the vibe and people watching. The Tower of London for me – I love how there’s so much of our history contained within it and you can make a whole day of it! We love the Natural History Museum. There is so much to see and do here, we have been many times as it’s so interesting and everyone in the family loves the same. Best of all it’s free! London is vast. But wherever you go there is plenty to photograph. I Enjoy visiting the science museum and natural history museum. I would love to visit in the eve to take some great pics.